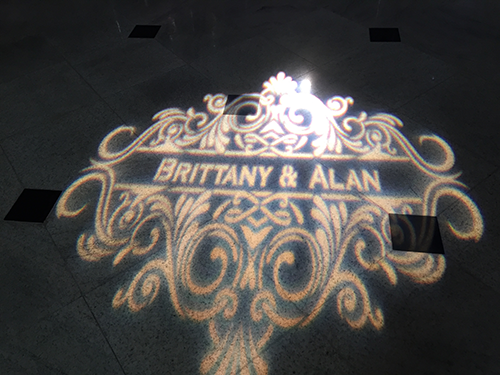 Dance across your own names on your very own personalized dance floor with a Monogram Gobo. Your beautiful, illuminated monogram will create a one-of-a-kind experience to give your wedding that extra special touch. Upon booking your Monogram Gobo, 1-800-Jam-Music will help you design the perfect monogram. We can provide you some examples to choose from or you can build your own and have something completely custom created. We can work together to ensure your monogram matches the look and feel of your wedding design elements. Your Gobo will be etched into an aluminum disc which we will package up and give to you as another keepsake from your Wedding.